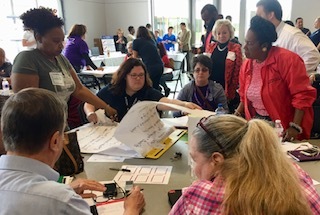 Civic Saturdays were conversations that took place across Harris County on seven consecutive Saturdays between early February and late March, 2019. 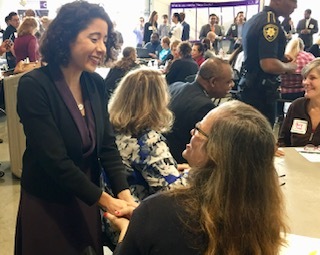 The event series has been the central component a larger effort of Harris County Judge Lina Hidalgo to run an “open transition“ at the beginning of her administration by leveraging the ideas of thousands of Harris County residents in informing the administration’s policy priorities. People from all walks of life joined the events, and represented 100 zip codes across the County. The events exemplified the power of inclusion, and how diverse forms of knowledge can make government more creative. The major themes, insights and concrete proposals shared at each of the events (including from the “action planning” workshops which involved 200+ cross-sector organizations), together with the findings of the county-wide Transition Survey (11,000+ responses), will be shared publicly. Our goal is to keep the momentum and energy of the initiative collectively-generated, collectively-owned, and biased towards action. Stay tuned. The fifth Civic Saturday was packed with residents and local leaders engaging in real dialogue about Economic Opportunities and Housing issues. Judge Hidalgo, along with Representative Armando Walle and Commissioner Rodney Ellis, welcomed folks with a commitment to listen to the ideas and shared experiences of the people most impacted by our county government's policies. One important part of Civic Saturday is educating our community on existing resources and programs. Dr. Laura Murillo with the Houston Hispanic Chamber of Commerce talked to residents about their education courses that are lifting up small business owners. Our partner, Christelle Palay with HOME Coalition, helped facilitate conversations surrounding affordable housing and resources for housing education. Together residents and leaders shared innovative ideas like using county-owned facilities as a place to offer low rent to small businesses, creating freed up funds for these businesses to offer more services and jobs for the community. Residents then participated in breakout sessions with elected leaders and local agencies. Discussions served different topics from job creation and small business support to housing education programs and creating a housing and transit strategy.